16:00 - At the end of the exercise in Titel that concluded the several-day long “Century of Victors 1918-2018” military exercise, Defence Minister Aleksandar Vulin congratulated the participants in the exercise and all members of the Serbian Armed Forces for an outstanding demonstration of its operational capabilities and readiness for the defence of Serbia. - An exercise like this is prepared for decades, an exercise like this is prepared with an army that is capable of not only exercising simultaneously at 10 places, but is capable of accepting battle in ten places. There are few armies in the world that can get organised in such a short period of time, come out at so many different directions and respond to every demand. The greatest value of this exercise is that we have shown the army exactly as it is, the army that has fulfilled all its tasks, as it would have fulfilled them in the war. These are not combined units, these are organic units, as they are and they were doing exactly what they were prepared for and what they were trained for. An exercise like this one cannot be prepared in a month and it is the fruit of great effort, great perseverance, great patience and great trust in the Serbian Armed Forces, Minister Vulin emphasized. According to him, since 2012 until today, the Serbian Armed Forces has turned from a demoralised and almost deserted army, an army that was supposed to disappear, into a modern, fighting force – an army undergoing renewal. - Therefore, I wish to thank the supreme commander Aleksandar Vučić for his perseverance and for all these years in which he tried and succeeded in renewing the army, improving and making it better and more modern. And now, before he went to Paris, where he is going to meet with some of the most important statesmen of the world, he invited me and asked me to submit a report when the exercise is over, and the exercise will be over when every soldier is safe and when each of them go to bed tonight. Care for every person, their safety and security. This is an exercise that showed that our army is capable of dealing with all the challenges and that no one can ignore the Serbian Armed Forces, and if anyone ever think of doing evil to our country and our people, no matter where they live, they will have to know that this contemporary, modern, powerful Serbian Armed Forces is ready to protect our country and our people and our way of life, Minister Vulin said. The minister of defence congratulated General Mojsilović, Chief of General Staff, on the exceptional organisation and preparedness, General Simović, Army Commander, for all that the Army and all its members showed, General Žarković, AF&AD Commander for a brilliant demonstration, the high readiness of all their members and for that great pleasure that, as he said, after many years, we could see eight MiG-29 planes in the sky above Serbia. - The sky above Serbia is free, Serbia is free and it will be as long as it has such an army and such people constituting the army. That is why we care about them, their standard, their family's standard, that is why we will have a salary increase again and we will still have better materiel, equipment, and housing construction. And as you can see, therefore we deserve both respect and love of the entire nation. I assess the exercise as “very good”, I assess the exercise as the reason for pride of each of our members, and of every citizen of our country, as well, Minister Vulin concluded. In a very attractive presentation, members of the First Army Brigade, River Fleet, Special Forces Brigade, 250th Missile Brigade and 204th Air Force Brigade participated in cooperation with members of the Ministry of Interior's Gendarmerie. As the Chief of General Staff, Lieutenant General Milan Mojsilović, pointed out, the conclusion of today's exercise is “that all the goals that have been planned have been achieved”. - Decisiveness, capability, courage, the attitude of our country towards our army and the Armed Forces towards the country makes the Serbian Armed Forces determined to continue to be at service of its people, General Mojsilović said. Participants in the exercise demonstrated negotiating water obstacle, setting up a pontoon bridge, ferry crossing point, as well as infantry, anti-personnel, marine and anti-marine operations. Prime Minister of Vojvodina Igor Mirović stressed that the exercise showed that the Serbian Armed Forces is changing for the better. - It showed how it has been changing for the better in terms of organisation, training and equipment. 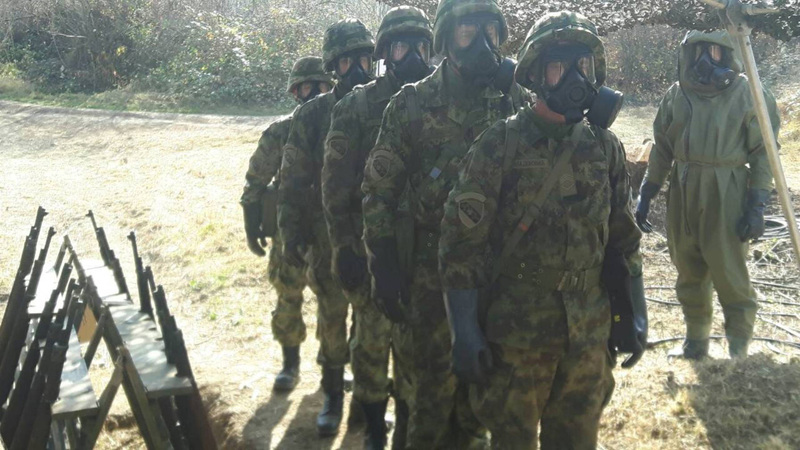 Everything is shown in real time and really leaves a strong impression, Mirović said, adding that he was a “reservist” and hoped that the members of members of the reserve would show once that they were ready to participate in such exercise. 15:40 -The pontoon bridge has been installed over the Tisa River to be crossed by combat forces. The bridge is 200 meters long and has 32 components. The crossing point is secured by two MiG 29 aircraft. 15:32 - Participants in the exercise from the River Fleet complete the effective display at Titel with a parade. 15:17 - Combat ships of the River Fleet form an offensive arrangement for attack against enemy ships that is just beginning. Ship artillery will operate first in an attack from the bow, and then, after successful execution of the attack, the ships turn and withdraw from the battlefield, operating against the enemy ships from the stern section. 15:00 - The River Fleet and Special Forces Brigade show the antisabotage action of divers with underwater weapons, the action of a group of ships and patrol boats, waterborne and multipurpose ships in the execution of live firings. 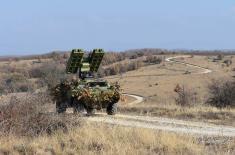 “Kozara” flagship is changing location to monitor the second part of the exercise at Titel. 14:50 - At the moment, at Titel, fighting vehicles are being transported across the Tisa River, on the installed ferry with nine components. Tanks are also on the ferry to be involved in the activities of infantry and artillery against the enemy after their transportation. At the Titel training area, the primary responsibility for the exercise rests with the First Army Brigade, and the River Fleet, the Special Brigade, the 204th Air Force Brigade and the 250th Missile Brigade of the Air Force and Air Defence are cooperating. 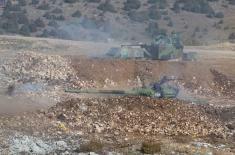 In total, 170 fighting assets and about 1,300 troops are engaged. 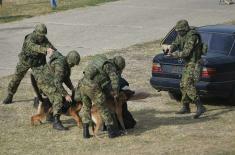 Members of the Gendarmerie of the Serbian Ministry of Interior are also engaged in the exercise. The purpose of the exercise is to demonstrate the training level and firepower of the First Brigade and the River Fleet for the preparation and execution of an offensive operation in the waterway engagement, with an aviation support. The exercise directors are the First Brigade Commander, Brigadier General Željko Petrović and the River Fleet Commander, Navy Captain Andrija Andrić. 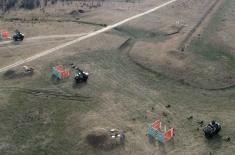 The exercise is intended to demonstrate negotiating water obstacle, i.e. the Tisa River, then the installation of the pontoon bridge, ferry crossing point, as well as infantry, anti-personnel, ship, marine and anti-ship activities. Also, infiltration of a reconnaissance group into the enemy's combat formation, search of the river bed and laying of mine obstacles with continuous artillery and aviation support, two MiG-29 aircraft and a pair of Galeb G-4 aircraft. On the Tisa River, besides the ships, amphibians can also be seen, as well as actions and procedures during the assembly of the pontoon bridge, transport of tanks and other fighting vehicles on a ferry, and the attack by special forces members against the ship. In the vicinity of Sremska Mitrovica, the tank battalion conducted a march in the direction of the “Boško Pavlkovljević Pinki” barracks in Sremska Mitrovica - the Manđelos facility - the village of Manđelos - the village of Šuljam, in order to create the conditions for the commitment. In total, 30 combat assets and about 100 soldiers were engaged. 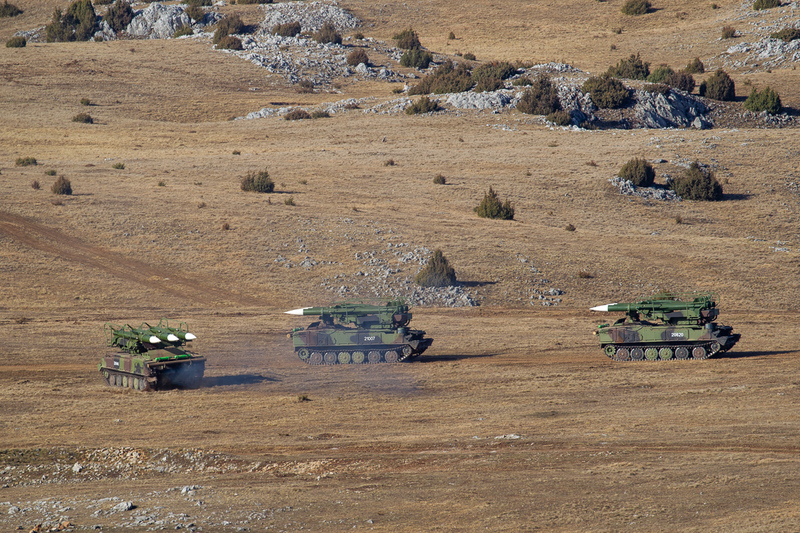 The purpose of the demonstration is to show the capability of a tank battalion for the conduct of march in the conditions of the plain area and its readiness to respond to possible challenges, risks and threats to the security of Serbia. 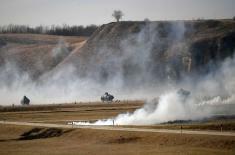 During the exercise, the procedures of tank crews were shown during the invasion of enemy aviation, encountering contaminated land and mines, providing assistance to the wounded, crossing over the bridge and procedures during the march. Based on the demonstration, citizens can have full confidence in the tankmen of the First Brigade and the Serbian Armed Forces. On Zvornik Lake, a total of 20 combat assets and about 100 members of the Special Forces Brigade and the River Fleet were engaged, carrying out a raider action against the elements of the enemy's combat formation. 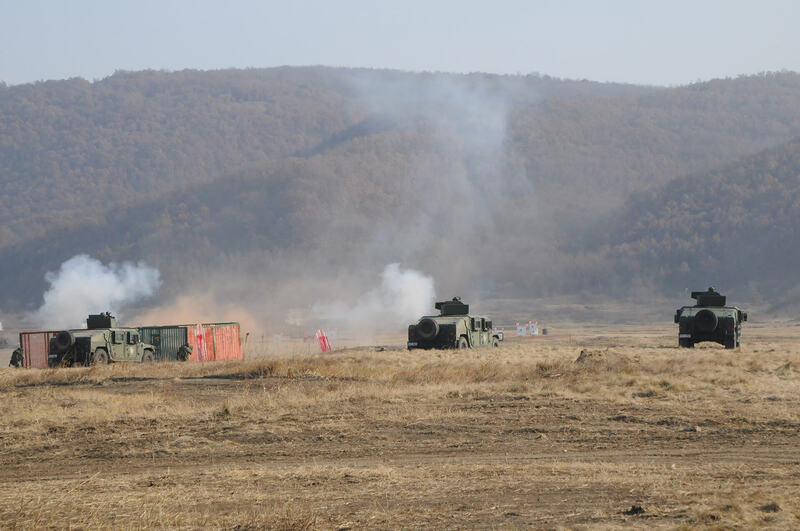 At the beginning of the exercise, three teams on six GDQ-120 boats on the Zvornik lake are approaching site of the attack and operating from their personal weapons and fire support assets destroying the spotted firing points. Then they make passages in the fortification obstacles, after which they establish a bridgehead for disembarkation of the second wave. In the second wave, four teams on four GDQ-120 boats and two PTS-M amphibious transporters, with the security and support of the forces on the bridgehead, disembark on the shores of the lake. Four teams then board on motor vehicles heading to objects of raider attack. Three teams and an amphibious squad remain on the coast in order to secure the bridgehead. After a successful raider attack and neutralisation of the enemy, teams withdraw. The top-level tactical competence, firing competence and efficiency and effect of the action of reconnaissance and raider teams have been shown. Successful actions have shown readiness of the Serbian Armed Forces to respond swiftly and decisively to all attempts of jeopardising the territory, people and property. It is also a confirmation of the readiness of forces to respond rapidly to a wide range of possible threats, to which all the countries in the world are actually or potentially exposed today. The members of the Serbian Special Forces will respond to any endangering attempt in an adequate and efficient manner. 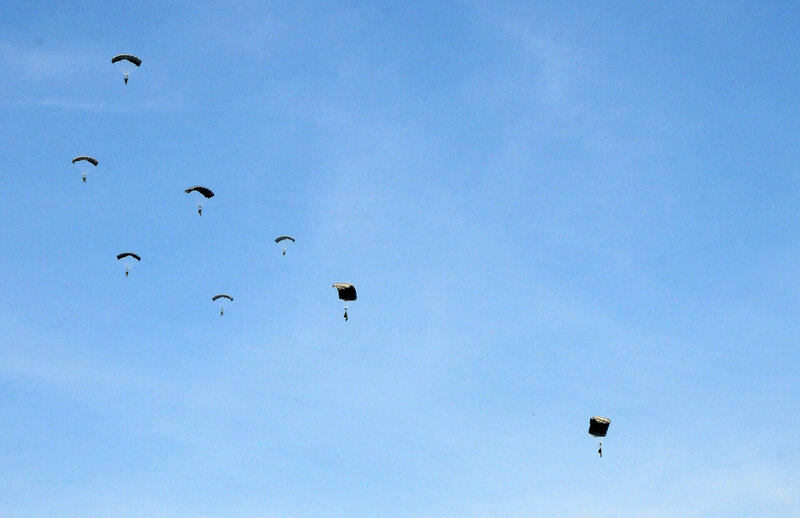 13:33 - The members of the Serbian Special Forces have shown today at Međa training area infiltration of a reconnaissance group in a parachute landing, gathering intelligence on enemy using “Small Milosh” and blocking terrorists by parachute assault using М-86 police fighting vehicles. 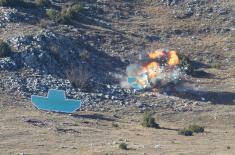 Companies for counter-terrorist operations effectively carried out the task of destroying the terrorist base, operating from snipers and machine guns from a HMMWV vehicle, simultaneously introducing another air team with a technique of quick landing from helicopter. An attractive part of their presentation was the capture of terrorists who tried to flee. 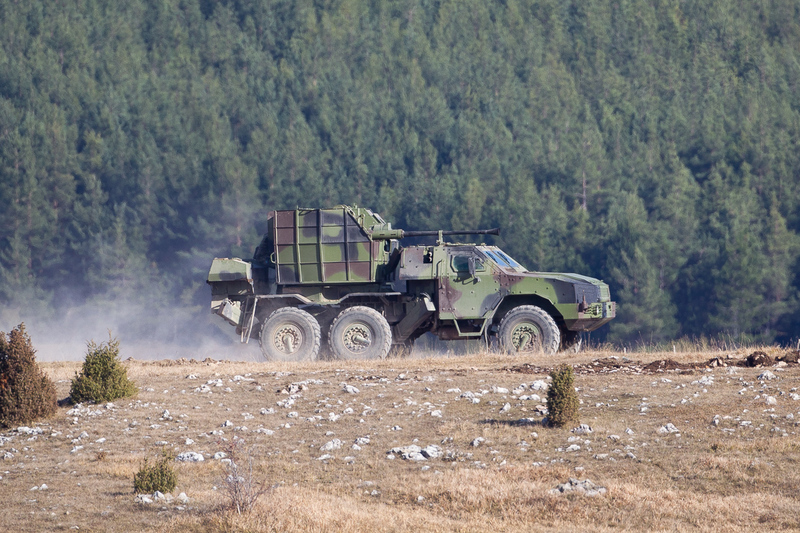 At the Međa training area near Leskovac, about 600 members of the Special Brigade, the Third Battalion of the Military Police and the AF&AD demonstrate, with employment of 74 fighting vehicles, qualification of units in solving tactical and firing tasks in action against terrorist groups. 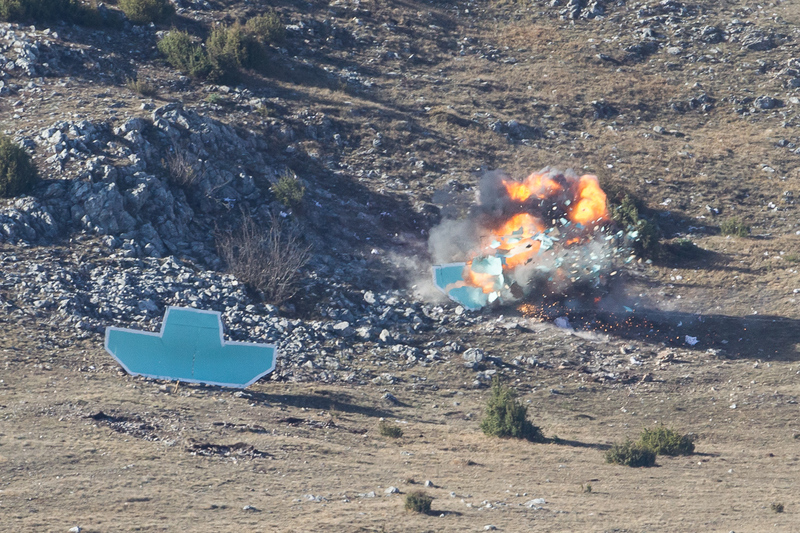 Tactical exercise on the theme of “Reinforced Military Police Battalion in Counterterrorism Operation” has more than one units, and the most important are special landing, classical landing, attack of teams against a terrorist base, attack of teams against terrorists who are retrieving and attack of teams against the vehicle and escape of terrorists in the vehicle itself. 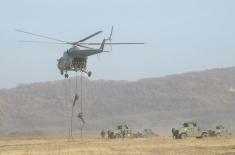 The exercise is very dynamic and this is only a part of the demonstration of training level of members of the Special Forces Brigade and the Army in carrying out their assigned tasks. Members of the 246th CBRN battalion from Kruševac take part in the exercise at Veliki Jastrebac. Today they showed the engagement of members of the unit in tasks of nuclear, chemical and biological defence, then on observation and reconnaissance of directions and areas of combat operations, processing of collected data and decontamination of contaminated units. 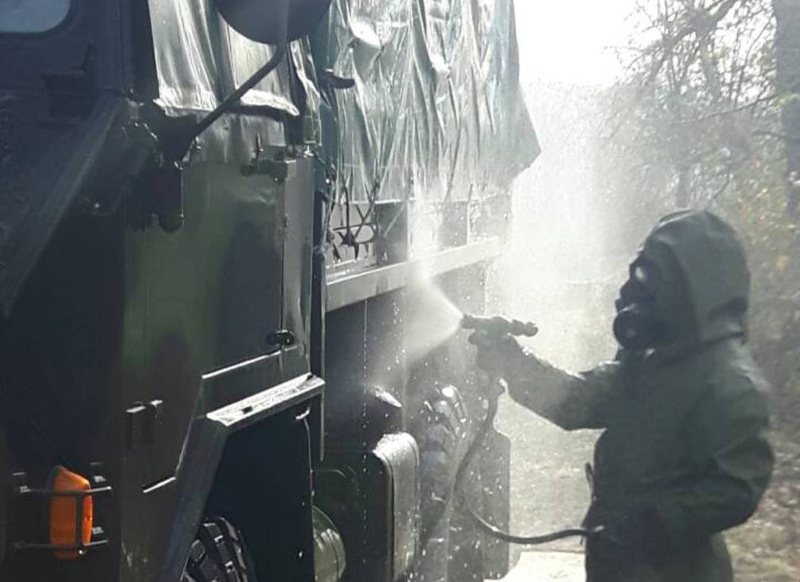 At Veliki Jastrepec, 26 combat vehicles and 120 soldiers were deployed, demonstrating the establishment of a station for the decontamination of human and military equipment, as well as the work of the observation post at the moment and after a nuclear explosion. The aim of all actions is to use the decontamination procedures for the contaminated unit to be recommitted. 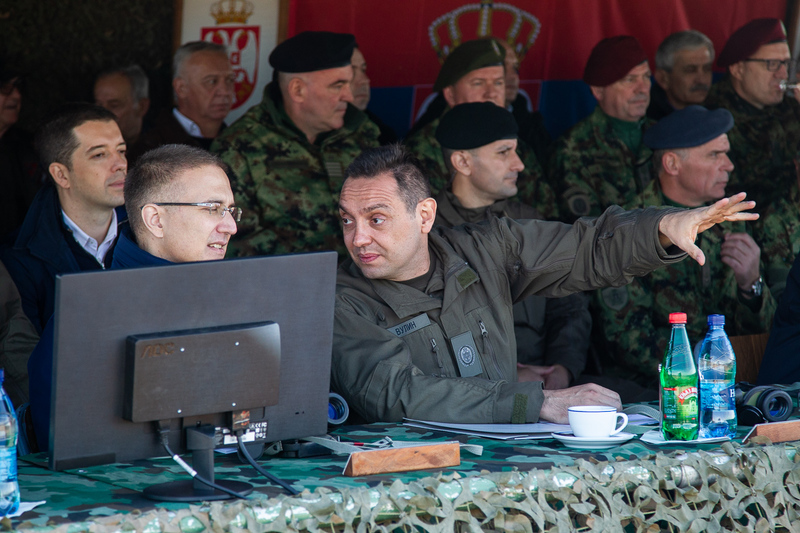 Deputy Chief of the Verification Centre of the Republic of Slovenia, Lieutenant Colonel Srećko Matović, is one of 15 foreign observers from the countries of the Organization for Security and Co-operation in Europe and China, who watched the exercise at the Pešter training area today. - On behalf of foreign observers, I thank the Republic of Serbia for the invitation and opportunity to see your military capabilities while watching the exercise “Century of Victors 1918-2018”. We had the opportunity to see the high level of expertise, readiness and capabilities of your army - Lieutenant Colonel Matović said, adding that the number of personnel and materiel is below the number that they are obliged to report under the Vienna Document. 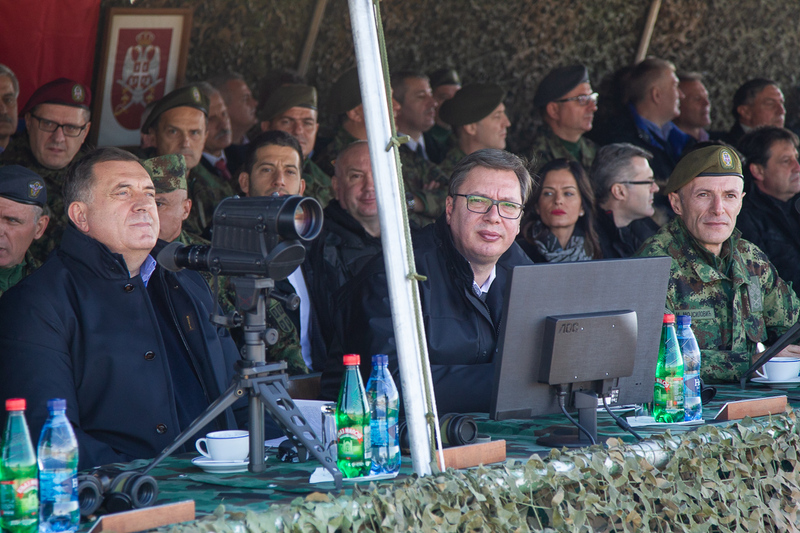 12:30 – After the exercise at Pešter, President Vučić assessed the demonstration very successful as it showed all the capabilities of the Serbian Armed Forces. 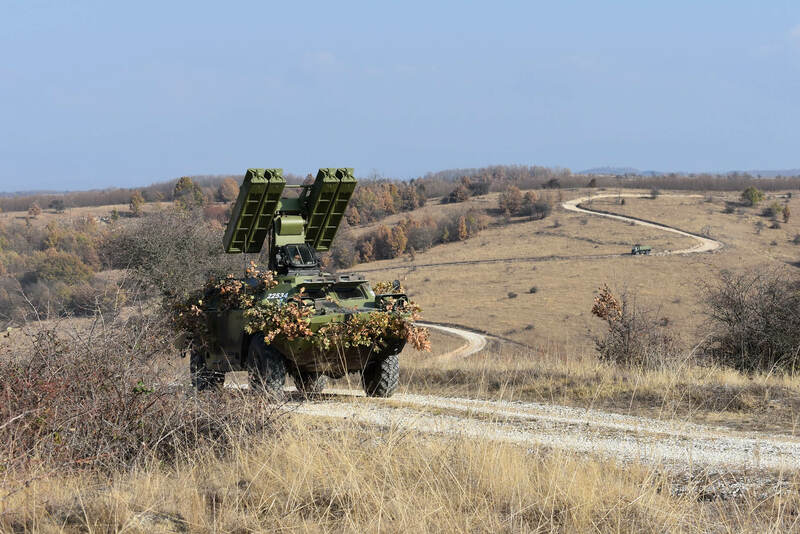 Eight MiGs, |Eagles, helicopters, PASARS system, new NORA, Lazar 3 vehicle, are just a part of the armament that operated in support of the attacking units. This is a motive to continue to take care that the Serbian Armed Forces is growing and developing in the interests of Serbia's peace and security. Congratulating Minister Vulin and General Mojsilović, as well as all the participants on the successfully conducted exercise on Pešter, President Vučić stressed that he was very happy with what has been shown today, adding that there is no structure as military that takes so much time to see the invested efforts and the financial funds, which require stable public finances, as well as the good work of the Government. - When you compare what we had in 2013 and today, five years later, these are simply not the same armies. I think that you could see today that all of our soldiers and special forces members were smiling when the exercise was over. First, we had heavy and demanding live firings, from planes, helicopters, tanks, armoured fighting vehicles, NORA and PASARS that have new ceramic armour to make it easier to move - product of our brains. As far as I know, we did not have any accidents, and the guys did the job in an extraordinary way - President Vučić said. He thanked all the participants in this exercise, adding that investments in the military will continue to increase even further, that by the end of 2019, it will be possible to see a huge progress, as most of the assets, weapons and tools are expected in early and middle next year. 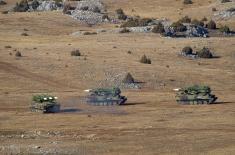 - By that Serbia shows that it can protect itself and can improve its Armed Forces. 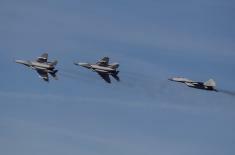 Eight MiG 29 planes were seen today, we have ten in total, and by the end of March, with what we took from Belarus, we will have 14 MiG-29s. We were never able to have five of them in the air. We are doing all this so that we can preserve the freedom and independence of our country and to have peace. These weapons are not here for us to use it - it must be ready for use. But we have weapons and tools and we are improving our army, primarily because of the fact that it exerts preventive influence and for everyone to think what kind of response would it be in the event of a potential attack - President Vučić said. 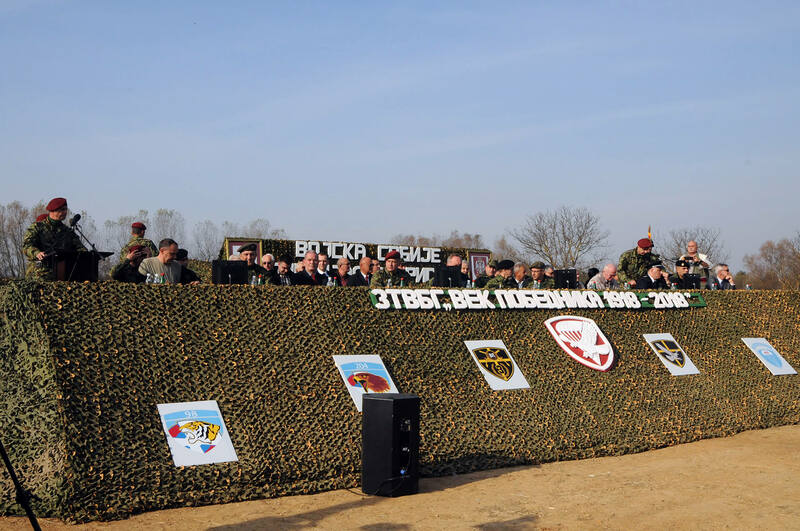 He added that today only on Peshter 26 tanks could be seen, while 25 were displayed in Pasuljanske livade training area, 13 more will be seen in Titel, and they will be also seen in Sremska Mitrovica. 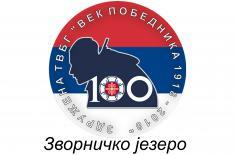 - All 100 tanks for a hundred years of magnificent Serbian victory in the First World War, in honour of our heroes, our ancestors and for the pride of our descendants - President Vučić said. Responding to a journalist's question of why the Serbian Armed Forces was destroyed in the previous period, President Vučić said that the improvement of the situation in the Armed Forces had to be preceded by fiscal consolidation resulting from the good work of the Government. - It is in our interest to have a strong army, which is not in the interest of the countries that were in conflict with us, so they found some among us with whom they jointly weakened the strength of our army - President Vučić said, adding that today all members of the Serbian Armed Forces are proud of what they have seen, assessing that our people and citizens of Serbia can be proud of the strength of their army. Commenting on the budget of the Ministry of Defence for the next year, given that big acquisitions have been planned, the president said that a lot of money has already been earmarked for the defence, and that the budget amounts to EUR 600 million, and that the real budget is over EUR 1 billion. Congratulations for the successfully organized and conducted exercise were also sent by the member of the B&H Presidency Milorad Dodik, pointing out that this is necessary in order to preserve peace, and for that it is necessary that Serbia has developed powerful armed forces. - For us who live outside Serbia, and we are Serbs, it gives great pride of all that Serbia has and the achievements that have been shown exactly at this exercise, Dodik pointed out, adding that his desire is to have permanent peace in this area. 12.15 On Pešter, M84 tanks, M80 infantry fighting vehicles, “Gvozdika” 122 mm self-propelled howitzers, POLO M83 armoured fighting vehicle and “Oganj” BRDM-2 multiple rocket launcher, “Giraffe” radar, and among assets that will soon be introduced into the armament of the Serbian Armed Forces, the PASARS system and “Nora” 155mm B52 howitzer. 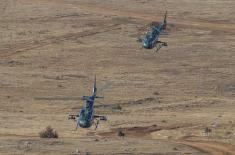 From the Air Force component the assets involved in the exercise are MIG-29, ORAO J-22, “Gama” and MI-8 helicopters, KUB system and AN TPS-70 radar. 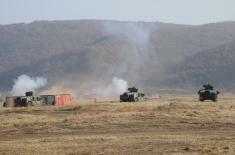 11:58 – Air combat support was followed by artillery and missile-armed preparation. 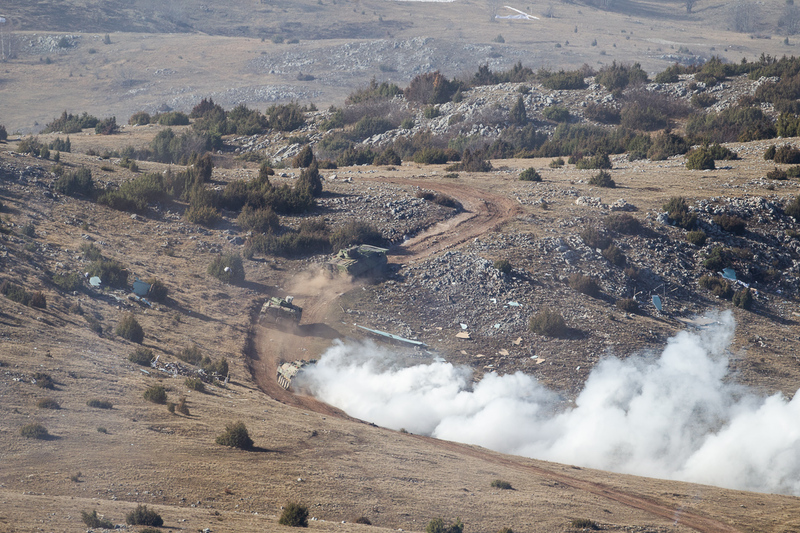 11.50 - On the provisional Pešter training area, exercise dubbed Battle group on the march with the transition to attack started by the Second Army Brigade, in cooperation with the Fourth Army Brigade and units of the Air Force and Air Defence. 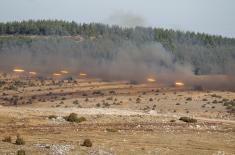 The exercise include about 2,000 soldiers and more than 100 combat assets. 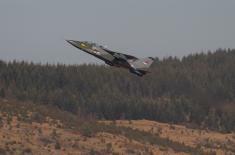 The exercise started with eight MiG 29s in the patrol. The exercise will demonstrate the effects of fighter aviation, fighter-bomber aviation, artillery and M-84 tanks, using combat assets that will soon be introduced into the armament of the Serbian Armed Forces. 11:45 – The audience was greeted by Commander of the Second Brigade, Brigadier General Željko Kuzmanović. He performed geographical, topographical and tactical orientation and pointed out the basic details of the exercise. President Vučić has just arrived at the Pešter training area. There are also the Prime Minister Ana Brnabić, Minister of Defence Aleksandar Vulin, members of the Government, Chief of General Staff, Lieutenant General Milan Mojsilović, representatives of the Ministry of Defence and the Serbian Armed Forces, associations cherishing the traditions of Serbian liberation wars, military diplomatic corps, local government and numerous guests. The exercise is attended by member of the B^H Presidency Milorad Dodik and of Republika Srpska Željka Cvijanović. 11:20 - The demonstration of training level included also the work at the checkpoint, the manner of stopping vehicles with the stopping tape, the work of service dogs of the protection service in overpowering terrorists, as well as the work of the anti-sabotage team in the execution of the anti-sabotage inspection of vehicles using service dogs and protective equipment. The inspection team consisting of a crime scene technician and a crime suppression officer conduct the on site inspection. 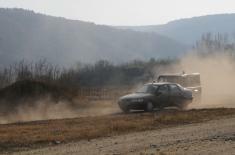 At the Orešac training area, at the exercise that has just started, more than 150 members of the 5th Military Police Battalion are conducting an anti-terrorist operation by occupying the line of wider blockade, search of the terrain, rounding up a terrorist group, attacking a terrorist group and pursuit of the escaped terrorists. 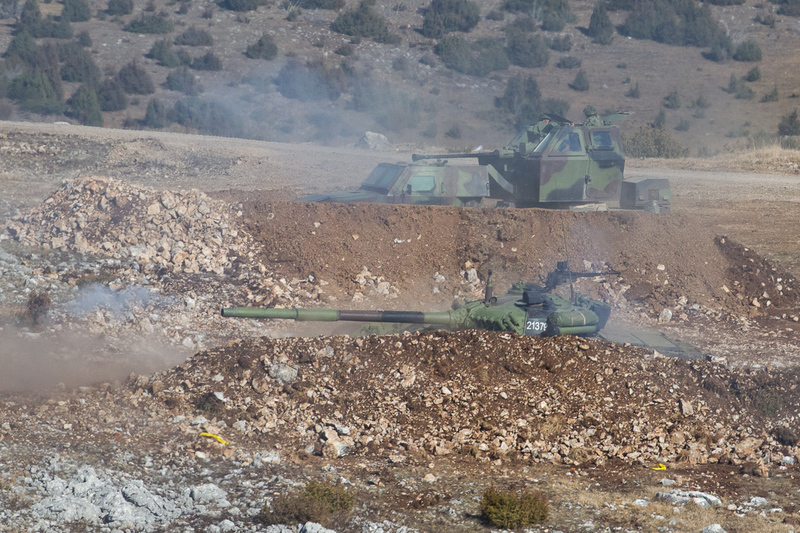 The exercise on the theme of “Military Police battalion blocking, rounding up and destroying a terrorist group” included units on M-86 fighting vehicles of Military Police, from which the gunners fired M-86 machine gun. Sniper pairs, riflemen with 5.56 mm M-21 automatic rifles, MP5 9 mm Heckler and Koch sub-machine guns and CZ 99 9 mm pistols operated as well. 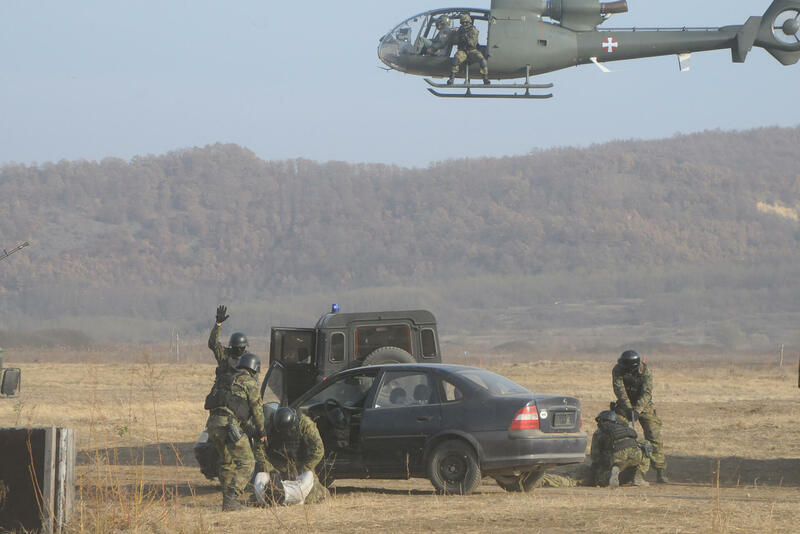 Exercise at the military complex "Borovac" near Bujanovac, has started, performed by members of the Fourth Army Brigade and the Multinational Operations and Pre-Deployment Training Centre. 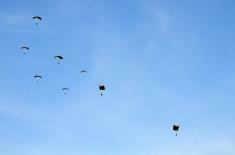 The exercise include about 1,000 soldiers and 100 combat assets. The primary responsibility for the exercise rests with the Fourth Brigade, and the commander is Brigadier General Slobodan Stopa. The aim of the exercise is to show the training level of the reaction forces performing tactical actions and procedures during the operation in different soil and weather conditions, day and night. The focus is on demonstrating the training level of forces to command in the decision-making process, preparing for the organisation of the operation and commanding units in the operation. During the exercise, the movement of two columns from the Vranje garrison to the location of the deployment, the execution of actions when encountering the anti-tank mines and search of the terrain were carried out. 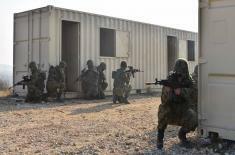 In the final part of the exercise, the infiltrated enemy group was neutralised. 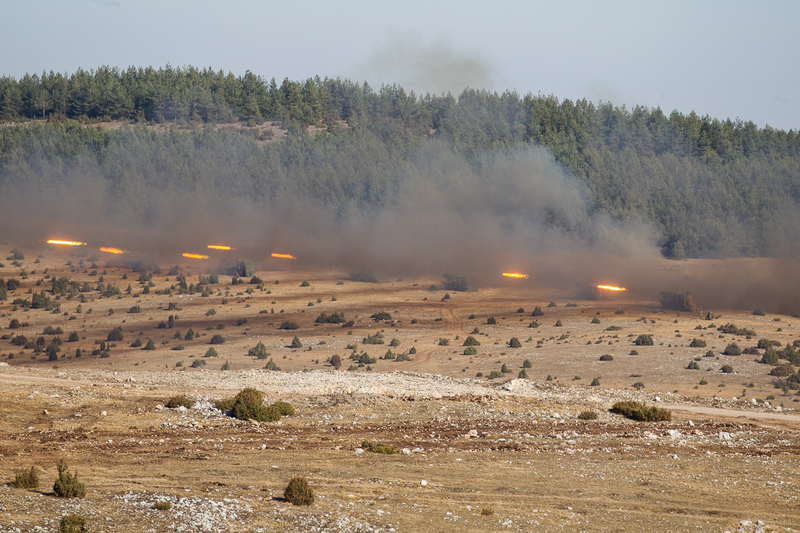 By effective actions at the end of the exercise, the reaction forces of the Fourth Brigade confirmed that they were fully trained and qualified to carry out the assigned tasks. 10:25 – In his statement to RTS, President Vučić emphasized that the Serbian Armed Forces is progressing by “seven-mile steps” and that it is one of the most qualified in the region. It will be even stronger, with further modernisation. The goal is that by increasing the salaries, providing new clothes and shoes, by building apartments, we have a satisfied and strong Serbian Armed Forces and the security services. - We have seen eight MiGs out of 10 we have. We saw tanks, out of the total of 100 tanks participating in the entire exercise, and they will be seen by the citizens of Srem, Banat, because 13 of our tanks will cross the bridge that our engineers will install between Titel and Perlez. You will also see them in Kraljevo, as well as 25 on Pešter that act uniquely as a platoon in attack and a company in attack, President Vučić said. President Vučić also assessed that the generals of the Serbian Armed Forces have prepared all this in the right way. - I am pleased that General Simović prepared the Army and all others how they did their job and the Third Brigade did everything remarkably. Apart from the two missiles that failed, all the others hit their target and “Plamen” acted remarkably, as did NORA, and our helicopters fired extraordinarily, Maljutka missiles hit their targets, President Vučić said. He commended the members of the Serbian Armed Forces who managed to carry out the most difficult tasks at Pasuljanske livade and told them that the investments in the Armed Forces and the better standard of its members would continue. - We have to solve the issue of equipping the members of the Serbian Armed Forces, we must take care of solving their housing issue. We need to be strengthened and acquire modern armament. Our army is at the very top in comparison with the armies of the region. The biggest drawback for us is the lack of personnel and we will work on it in particular. So, we are investing, working, and all these steps of investing and improving are not a one-mile step, but a seven-mile step. We intend to make people feel better, President Vučić concluded. 10:15 – President Vučić expressed his satisfaction with the operations demonstrated and announced even more acquisitions of modern weapons and even better standard of the members of the Serbian Armed Forces. He especially pointed out that today, during the exercise, eight MiG 29s are flying, artillery effectively fires at targets, missiles hit the targets, tanks in attack are powerful, and I am happy that even 8,000 people are practicing today and we have already seen how much they are ready and qualified. The Serbian Armed Forces shows that it is a respectable force, which we continue to invest in. 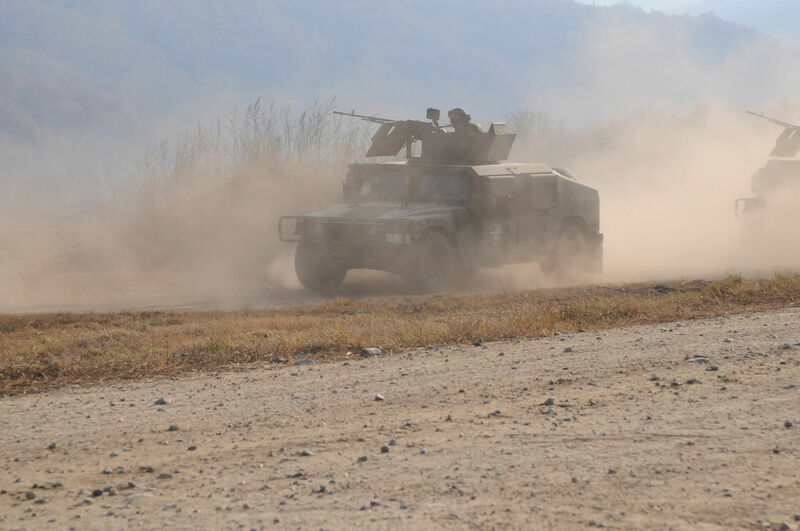 10:09 – Demonstration of interception of the enemy vehicle.. After successful interception, the patrol moves away with a captured enemy, aiming to collect information about the intentions of the enemy. 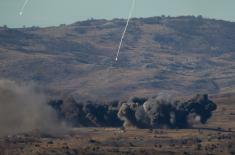 09:57 - Demonstration of the activities of reconnaissance units in different conditions started. President Vučić visits the field where the reconnaissance patrol works and neutralises the enemy. Intelligence is collected from captives. 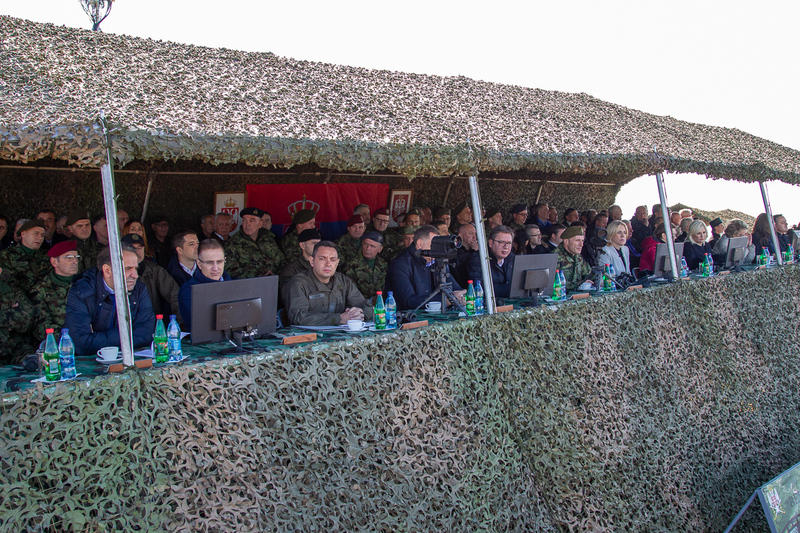 Upon completion of the exercise, President Vučić and guests watch demonstration of the activities of the reconnaissance units in different conditions and visit the static display of protective equipment, armament and optoelectronic devices. From the ballistic equipment there is a set of ballistic equipment of "0" series manufactured by YUMKO Vranje. At the display there are 9mm GLOCK 17 pistol, 5.56mm G36C automatic rifle, 5.56mm HK 416 automatic rifle, 5.56mm SCAR L ckuc automatic rifle, 5.56mm SCAR L std automatic rifle and 5.56mm FN MINIMI light machine gun. Among optoelectronic devices, there are DVS-8. Night vision goggles and binoculars passive, the MOSKITO day/night viewing laser range-finder, JIM UC multifunction thermal imager and Flir Recon B9 thermal imager. 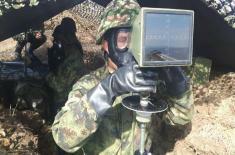 There are also several counter-sabotage devices, such as the NTJA-II explosives detector. 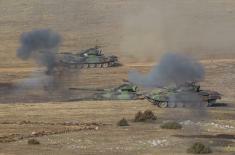 09:35 - Battle group transitioned into attack, with the support of artillery from 12 guns, to targets 12 kilometres away. 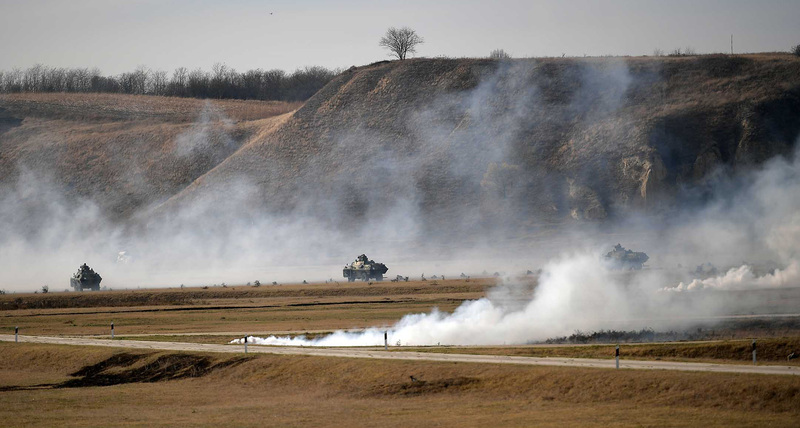 09:30 - At the Pasuljanske livade combined service training ground, the main responsibility for the exercise is with the 3rd Army Brigade, in cooperation with the Mixed Artillery Brigade and the 98th and 204th air brigades of the Air Force. Approximately 2,000 soldiers and more than 100 combat assets are engaged in exercise on the topic Battle Group in Attack, at this training area. 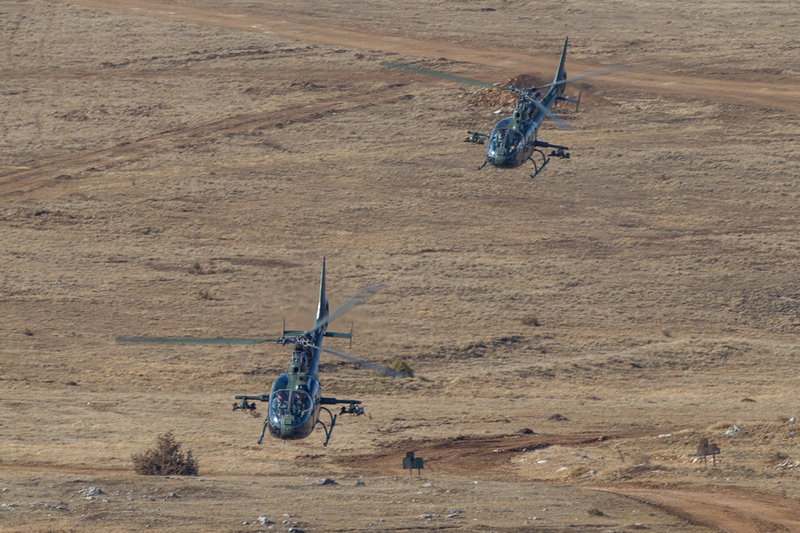 The exercise and demonstration of close support by aviation, technical and armoured units, as well as other units participating in the exercise, are underway. 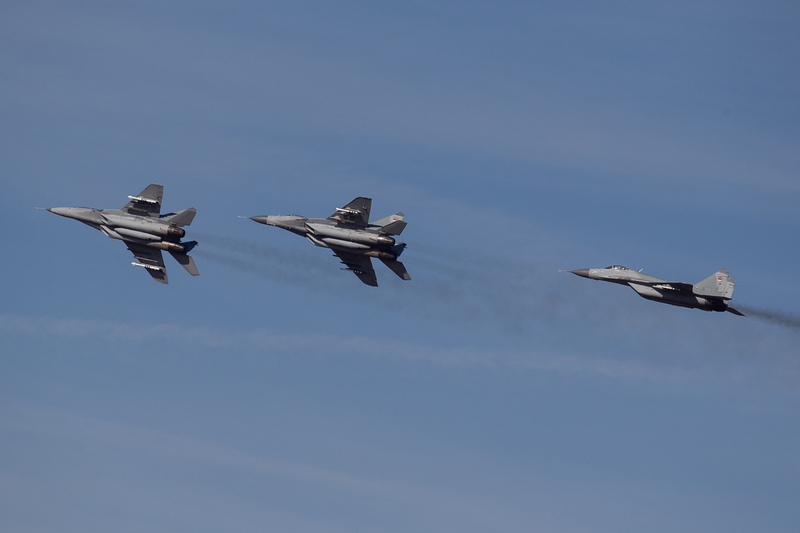 09.10 - The signal for the start of the exercise is given and six MiG-29s are flying over the training area. 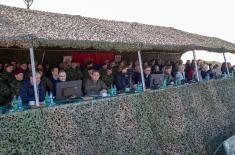 Exercise Director, Colonel Slađan Stamenković, Commander of the Third Army Brigade, comments on the exercise. President of the Republic of Serbia and Supreme Commander of the Serbian Armed Forces, Aleksandar Vučić, accompanied by Defence Minister Aleksandar Vulin and Chief of General Staff, Lieutenant General Milan Mojsilović, is coming to the Pasuljanske livade training ground, welcomed by the ceremonial lineup of the Guard. The exercises is attended by Prime Minister Ana Brnabić, members of the Government, representatives of the Ministry of Defence and the Serbian Armed Forces, associations that foster the tradition of Serbia's liberation wars, military diplomatic corps and numerous guests. Those present were greeted and given the basic information about the exercise by the Army Commander, Lieutenant General Milosav Simović. 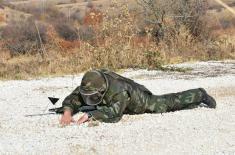 He pointed out that the Army Command was tasked with preparing, organising and carrying out a joint, one-sided, multistage live exercise at operational and tactical level on the topic of “Preparation and use of reaction forces of the Serbian Armed Forces” in cooperation with the AF&AD..
- During the preparations, special attention is paid to the cooperation between the Army branches, as well as the cooperation of our two services - Army and AF&AD. Through fire, movement, manoeuvre and impetus of attack, members of the Army and the AF&AD will show capabilities in carrying out tactical and firing tasks and readiness to protect the country of Serbia and provide peace to all citizens of the Republic of Serbia, regardless of their national, religious and political affiliations - Feneral Simović emphasized. According to him, since the 2nd November, the units have been on the ground where they carried out live firings of squads, platoons and companies , tactical drills, training flights, bombing and rocketing, landing and negotiating water obstacles. The exercise started on 8th November and ends today. Tactical exercise of the “Cobras” Military Police Special Operations Battalion. President of the Republic of Serbia and Supreme Commander of the Serbian Armed Forces, Aleksandar Vučić, accompanied by Defence Minister Aleksandar Vulin and Chief of General Staff, Lieutenant General Milan Mojsilović, attended yesterday's tactical exercise of the “Cobras” Military Police Special Operations Battalion in the framework of the joint live tactical exercise “Century of Victors 1918-2018”. With the exercise on the topic “Carrying out of counter-terrorism and security assignments”, conducted at the General Jovan Mišković barracks in Belgrade, one of the largest military exercises in the past few years has started. Members of “Cobras” presented in several demanding segments, determination, superior training level and engagement in realization of anti-terrorist and security assignments, with aviation support. They also demonstrated fighting techniques, negotiating water obstacles and situational shooting. In front of the state and military leadership, members of “Cobras” showed with their abilities and training level why they are one of the most elite units in the Serbian Armed Forces. The demonstration was also attended by the Secretary General of the President of the Republic Nikola Selaković, Minister of the Interior Nebojša Stefanović and Director of the Security Information Agency Bratislav Gašić. After the exercise, President Vučić pointed out that they showed excellent training level, fighting spirit and energy, as well as love for their country. - You must always be fully prepared, because it is very important that we have a unit such as “Cobras” that can, together with our Special Forces Brigade and other units, perform the most complex tasks in the most difficult conditions. I hope that you will never have to show it and apply it, but we must be ready to protect our country, needless to say that we will respond to other challenges of terrorism, which also you have to respond to, President Vučić said, adding that the readiness of the members of the “Cobras” must always be at the highest level, which they will always work on. President Vučić emphasized that members of the Serbian Armed Forces must “feel safe and sound” and have all they need at their disposal. - Thank you for loving our Serbia. We will regain reputation for our army, for it to be loved and respected, President Vučić said conveying message that such exercises will be organized once or twice a year and will be more massive. Upon completion of the exercise, the Deputy Commander of the “Cobras”, Lieutenant Colonel Goran Colić, on behalf of the battalion members, handed the parade dagger to Alexander Vučić, and thanked him for contributing to the construction and strengthening of the operational capabilities of the unit. Ministers Aleksandar Vulin and Nebojša Stefanović and Chief of General Staff Lieutenant General Milan Mojsilović, were presented Appreciation Letters and BIA Director Bratislav Gašić's was awarded a Plaque as a token of gratitude for cooperation. The closure of a combined, multistage and one-sided tactical live fire exercise dubbed “Century of Victors 1918-2018” is held today to mark the centenary since the end of World War I, in honour and glory of the Serbian heroes who won great victories and freedom for their Serbia. The exercise is based on the decision of the President of the Republic of Serbia and Supreme Commander of the Serbian Armed Forces Aleksandar Vučić, the guidelines of the Minister of Defence Aleksandar Vulin and the order of the Chief of General Staff of the Serbian Armed Forces, Lieutenant General Milan Mojsilović. 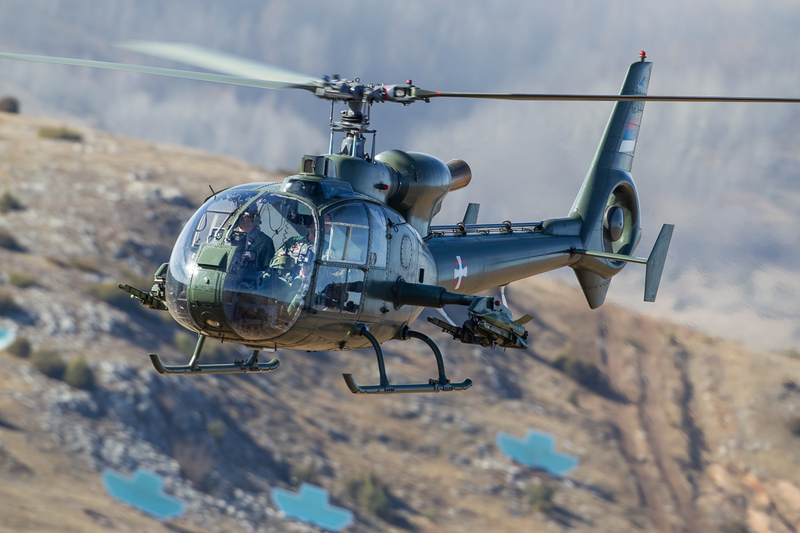 The person responsible for planning, organising and carrying out the exercise is the Army Commander, Lieutenant General Milosav Simović, and the Exercise Director is Brigadier General Vladeta Baltić. The exercise involves about 8,000 members of the Army and Air Force and Air Defence, 645 combat systems and assets and 24 aircraft. The exercise is carried out on the topic of “Preparation and use of reaction forces of the Serbian Armed Forces”, concurrently at 10 locations - Pasuljanske livade, Pešter, Titel, Međa, Borovac and Orešac and in the regions of Veliki Jastrebac, Zvornik Lake, Sremska Mitrovica and the Military Academy in Belgrade. 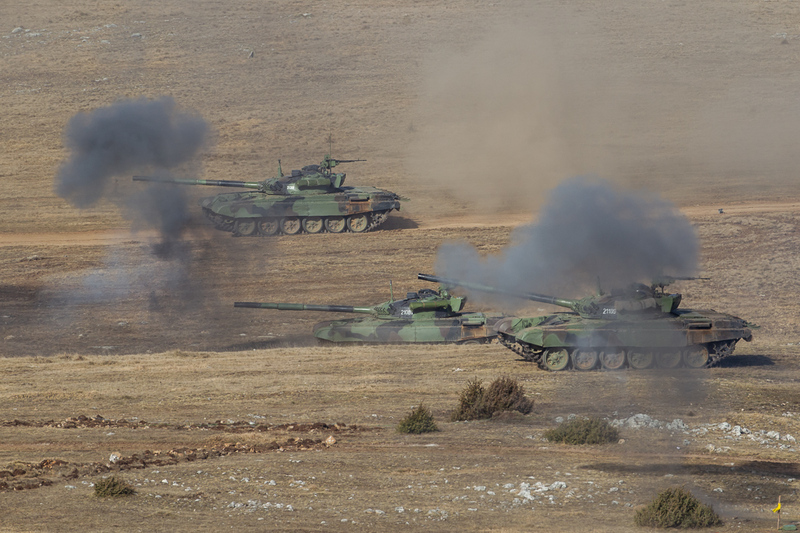 The most important fighting systems of the Army involved in the exercise are M84 tank, M80 infantry fighting vehicle, Gvozdika 122mm self-propelled howitzer, POLO M83 and BRDM-2 armoured vehicles, Nora 152mm towed gun-howitzer and Oganj and Plamen-S multiple rocket launchers, Strela 10M and Strela1 self-propelled launchers, M-83 police combat vehicle, Small Milosh, ships, tug-boats, boats, amphibious vehicles, Giraffe radar, Hummer and Defender off-road vehicles, engineering, field and other special vehicles. From the composition of Air Force and Air Defence, the exercise will involve MIG-29, ORAO J22, Galeb and AN-26, Gama, MI-8 and MI-17 helicopters, KUB system and AN TPS-70 radar. The assets that will soon be introduced into the armaments of the Serbian Armed Forces, Lazar-3 combat vehicle, PASARS system and the Nora B-52 howitzer with 152 mm gun. There are also optoelectronics, protective ballistic equipment, a large number of new and modern infantry and small arms and weapons and equipment from the 1500 project, which are equipped primarily for all special purpose units and tasks. The Ministry of Defence and the Serbian Armed Forces have decided that a large military exercise, that had not been seen in Serbia before, show its citizens that the Serbian Armed Forces was ready and able to defend and succeed in defending its Serbia and every citizen of our country. The exercise will be conducted by officers, non-commissioned officers and soldiers of the same honour and dignity as their role models from the famous Serbian Army.